PRINCE2 is a structured project management method and practicioner certification programme developed from PROMPT II for the UK government. The emphasis of PRINCE2 is on dividing larger project into more easily manageable and controllable parts and stages. PRINCE2 is chiefly used in western Europe and Australia, and is available in several different languages. 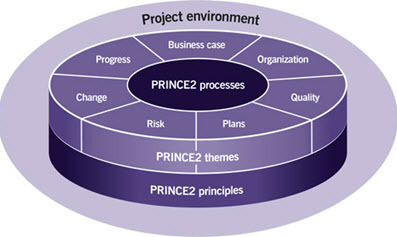 PRINCE2 was developed as a UK government standard for information systems projects. In July 2013, overship was transferred from HM Cabinet Office to AXELOS Ltd.
AXELOS Ltd is a jount venture by HM Cabinet Office (49% of the stakes) and Capita plc (51% of the stakes). Capita plc (LSE: CPI) is an international business process outsourcing and professional services company headquartered in London. Tailor To Suit The Project EnvironmentYou can read more about these principles here. This is the process where the project team is appointed and a project brief is produced. The project team must have an executive and a project manager. This is where the business case is completed and the required Project Inititation Documentation is assembled. This process managment method helps the Project Board oversee the project as it moves forward. Processes for controlling each individual stage of the project. Among other things, this includes how work packages are authorized and distributed. The main purpose of this process is to be a controlling link between the Project Manager and the Team Manager (or Team Managers). It involves establishing clear and formal requirements for the acceptance, execution and delivery of project work. This process is about handling the transitions from one stage to the next within the project. Among other things, this process invovles the formal decommissioning of a project, project and product evaluation, and follow-up actions. Various training courses are available for PRINCE2. After completeing a course provided by an Accredited Training Organization (ATO), the individual will receive the corresponding certification. Passing an exam is always required to complete a course. Training and exams are available both in person and online. AXELOS publishes a searchable register over individuals that have been certified. FOUNDATION LEVELThe holder of this certificate has adequate knowledge and understanding to work in a project management team using PRINCE2. The holder of this certificate has adequate knowledge and understanding to apply PRINCE2 in a scenario situation. AGILE FOUNDATION LEVELThe holder of this certificate has adequate knowledge and understanding of the PRINCE2 method and agile way of working and how agile can be combined to PRINCE2. AGILE PRACTICIONER LEVELThe holder of this certificate is able to apply the project management principles of PRINCE2 whilst combining agile concepts such as Scrum and Kanban. AXELOS are responsible for the accreditation process that an organisation must go through to become an ATO. Trainers must pass a surveillance check every 12 months and become re-accredited every 3 years. Every process in PRINCE2 has a note on scalability, since not every aspect of PRINCE2 will be applicable to every product. The notes should guide the project manager and other participants when deciding how much of the process that should be applied. This makes it easier to tailor PRINCE2 to each specific project. On the downside, there is a risk of omitting so many elements that the project turns into a so called PINO: PRINCE2 In Name Only. In 1989, CCTA adopted a version of PROMT II as a UK Government standard for information systems project management. CCTA was the Central Computer and Telecommunications Agency; a UK government acency responsible for providing computer and telecoms support to government departments. Once the CCTA had adopted PROMT II, they started using the name it PRINCE, an acronym for PROMT II IN the CCTA Environment. In 1996, PRINCE2 was launched – a generic project management method that wasn’t specifically tailored for use in the UK governmental IT environment. At this point, PRINCE was already a popular tool with many non-governmental enterprises, in and out of the UK. In 2009, a Civil service competition was held, after which it was decided that PRINCE now meant PRojects IN a Controlled Environment. A major revision, launched in 2009. A major revision launched in 2017, chiefly aimed to make the program better equipped at handling recent changes in practical business practises. Many of the changes were based on feedback from PRINCE2 users.